For the movie with the same name, see .45 (film). Not to be confused with .45 Colt. The .45 ACP (Automatic Colt Pistol), or .45 Auto (11.43×23mm) is a handgun cartridge designed by John Browning in 1905, for use in his prototype Colt semi-automatic pistol. After successful military trials, it was adopted as the standard chambering for Colt's M1911 pistol, being named .45 ACP. During the late 1890s and early 20th century, the U.S. Cavalry began trials to replace their sidearm arsenal of issued .45 Colt Single Action Army (SAA) in favor of the more modern and versatile double-action revolver in .45 Colt. After the example of the Cavalry, the Army in turn had fielded versions of double-action revolvers in .38 Long Colt. It was eventually evaluated that the .38-caliber round was significantly less effective in overall stopping-power than the .45 Colt against determined opponents in cases such as the Moro juramentado warriors, who were encountered in the Moro Rebellion. The then-current issue rifle, the .30-40 Krag, had also failed to stop Moro warriors effectively; the British had similar lack-of-stopping-power issues switching to the .303 British, which resulted in the development of the dum-dum bullet in an attempt to compensate for the round's deficiencies. This experience, and the Thompson–LaGarde Tests of 1904, led the Army and the Cavalry to decide a minimum of .45 caliber was required in a new handgun. Thompson and Major Louis Anatole La Garde of the Medical Corps arranged tests on cadavers and animal remains in the Chicago stockyards, resulting in the finding that .45 was the most effective pistol cartridge. They noted, however, training was critical to make sure a soldier could score a hit in a vulnerable part of the body. Colt had been working with Browning on a .41 caliber cartridge in 1904, and in 1905, when the Cavalry asked for a .45 caliber equivalent, Colt modified the pistol design to fire an enlarged version of the prototype .41 round. The result from Colt was the Model 1905 and the new .45 ACP cartridge. The original round that passed the testing fired a 200 grain (13 g) bullet at 900 ft/s (275 m/s), but after a number of rounds of revisions between Winchester Repeating Arms, Frankford Arsenal, and Union Metallic Cartridge, it ended up using a 230 grain (14.9 g) bullet fired at a nominal velocity of 850 ft/s (260 m/s). 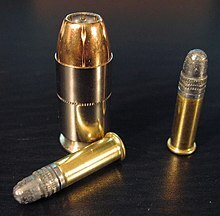 The resulting .45-caliber cartridge, named the .45 ACP, was similar in performance to the .45 Schofield cartridge, and only slightly less powerful (but significantly shorter) than the .45 Colt cartridges the Cavalry was using. By 1906, bids from six makers were submitted, among them Browning's design, submitted by Colt. Only DWM, Savage, and Colt made the first cut. DWM, which submitted two Parabellum P08s chambered in .45 ACP, withdrew from testing after the first round of tests, for unspecified reasons. In the second round of evaluations in 1910, the Colt design passed the extensive testing with no failures, while the Savage design suffered 37 stoppages or parts failures. The Colt pistol was adopted as the Model 1911. The cartridge/pistol combination was quite successful but not satisfactory for U.S. military purposes. Over time, a series of improved designs were offered, culminating in the adoption in 1911 of the "Cal. .45 Automatic Pistol Ball Cartridge, Model of 1911", a 1.273 in (32.3 mm) long round with a bullet weight of 230 grains (15 g). The very first production, at Frankford Arsenal, was marked "F A 8 11", for the August 1911 date. Other US military cartridges include: tracer M26 (red tip), blank M1921 (rolled crimp, red paper wad), M12 and M15 shot shells, and M9 dummy (holes in case). The cartridge was designed by John Browning for Colt, but the most influential person in selecting the cartridge was Army Ordnance member Gen. John T. Thompson. After the poor performance of the Army's .38 Long Colt pistols evidenced during the Philippine–American War (1899–1902), Thompson insisted on a more capable pistol cartridge. The .45 ACP is manufactured with both large and small pistol primers. The .45 ACP has 1.62 ml (25 grains H2O) cartridge case capacity. .45 ACP maximum C.I.P. cartridge dimensions. All sizes in millimeters (mm). The common rifling twist rate for this cartridge is 406 mm (1 in 16 in), 6 grooves, Ø lands = 11.23 mm, Ø grooves = 11.43 mm, land width = 3.73 mm and the primer type is large pistol. The cartridge headspaces on the mouth of the case at the L3 datum reference. According to Commission Internationale Permanente pour l'Epreuve des Armes à Feu Portatives rulings, the .45 ACP cartridge case can handle up to 131.000 MPa (18,999.9 psi) Pmax piezo pressure. In CIP-regulated countries every pistol cartridge combination has to be proofed at 130% of this maximum CIP pressure to certify for sale to consumers. This means that .45 ACP chambered arms in C.I.P. regulated countries are currently (2016) proof tested at 170.30 MPa (24,700 psi) PE piezo pressure. The SAAMI pressure limit for the .45 ACP is set at 21,000 psi (144.79 MPa) piezo pressure, while the SAAMI pressure limit for the .45 ACP +P is set at 23,000 psi (158.58 MPa), piezo pressure. The .45 ACP is an effective combat pistol cartridge that combines accuracy and stopping power for use against human targets. It has relatively low muzzle blast and flash, and it produces a stout, but manageable recoil in handguns, made worse in compact models. The standard issue military .45 ACP round has a 230-grain bullet that travels at approximately 830 feet per second when fired from the government issue M1911A1 pistol and approximately 950 feet per second from the M1A1 Thompson submachine gun. The cartridge also comes in various specialty rounds of varying weights and performance levels. It operates at a relatively low maximum chamber pressure rating of 21,000 psi (145 MPa) (compared to 35,000 psi/241 MPa for 9mm Parabellum and .40 S&W, 37,500 psi/259 MPa for 10mm Auto, 40,000 psi/276 MPa for .357 SIG), which due to a low bolt thrust helps extend service life of weapons in which it is used. Some makers of pistols chambered in .45 ACP do not certify them to use Plus P ammunition. 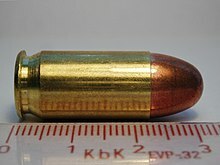 In its non-expanding full metal jacket (FMJ) version, the .45 ACP cartridge has a reputation for effectiveness against human targets because its heavy mass has the capacity to penetrate tissue deeply and damage the central nervous system, and its large 11.5mm diameter creates a more substantial permanent wound channel than other calibers, which can lower blood pressure rapidly if critical organs of the circulatory system are hit. In its expanding hollow point form, it is also particularly effective against human targets. In tests against ballistic gelatin, a 185 grain hollow point traveling at 1,050 feet per second expanded to about .76 inches. This is a significantly large permanent wound cavity for a handgun projectile. For those who follow the energy dump and/or hydrostatic shock theories of wounding ballistics, this is ideal. While slightly decreasing penetration and likewise the chance of hitting a vital organ, a large diameter wound will cause more blood loss. There is also a reduced likelihood of overpenetration, meaning that it is more likely that the projectile will transfer all of its kinetic energy to the intended target, thus more reliably incapacitating them. Drawbacks for military use include the cartridge's large size, weight, increased material costs in comparison to the smaller, flatter shooting NATO standard 9×19mm Parabellum cartridge, which uses less powder, brass, and lead per round. Standard 9mm NATO ammunition has limited armor penetration capability − a deficiency with .45 ACP whose large, slow bullet does not penetrate armor to any great extent. The low muzzle velocity also makes the bullet drop over long ranges, making hits more difficult; however, it is important to note that the vast majority of self-defense situations involving handguns typically occur at close ranges. Recent testing of the three major police and military calibers by the Federal Bureau of Investigation found that the .45 ACP was no more effective with regard to terminal ballistics than either 9 x 19mm Parabellum or .40 S&W. After two years of testing, one of the final FBI comments was that services that adopt (or stay with .40 S&W or .45 ACP) did so at the risk of increased recoil and a possible reduction in accuracy as 9 x 19mm with premium quality ammunition had nearly exactly the same performance. A factor rated by the recent FBI testing was accuracy and time to recover. The .45 ACP handguns ranked last, largely due to increased recoil. Additionally, some firearms selected were also less safe. Because of its large diameter and straight-walled design, the .45 ACP geometry is the highest power-per-pressure production, repeating round in existence. This is because of the higher powers achievable with .45 Super, and +P loads. Because of these inherent low pressures of the standard pressure round, however, compensators and brakes have little effect until +P and Super loads are utilized. With standard (not extended) single-stack magazines, pistols chambered in .45 ACP usually hold 8 rounds or less (exceptions to this include the 10-round standard 14 round extended capacity .45 ACP from Sig Sauer in their P227  and 13-round Glock 21) and 15 rounds, such as the .45 ACP versions of the FN FNP and FN FNX, though this greatly increases the pistol's bulk and with that lowers concealability. The Heckler and Koch USP .45 standard has a double-stack magazine that holds 12 cartridges. Several US tactical police units still use the .45 pistol round. While high capacity firearms are available in .45 ACP, the greater length and diameter of the .45 ACP means that the grip of the pistol must be longer and wider than the grip of a comparable pistol of a smaller caliber; this increase in grip size can make the pistol difficult to use for shooters with smaller hands. Today, most NATO militaries use sidearms chambered for the 9×19mm Parabellum cartridge, but the effectiveness of the .45 ACP cartridge has ensured its continued popularity with large caliber sport shooters, especially in the United States. In addition, select military and police units around the world still use firearms firing the .45 ACP. In 1985, the .45 ACP M1911A1 pistol was replaced by the Beretta M9 9mm pistol as the main sidearm of the U.S. military, although select Special Operations units continue to use the M1911A1 or other .45 ACP pistols. Because standard pressure and load .45 ACP rounds fired from handguns or short-barreled submachine guns are inherently subsonic, it is one of the most powerful pistol calibers available for use in suppressed weapons since subsonic rounds are quieter than supersonic rounds. The latter inevitably produce a highly compressed shock wave, audible as a loud "crack", a small sonic boom, while they travel through the air. Suppressors reduce the audible "report" by slowing and channeling the high speed gas generated by the burning/expanding gunpowder before it exits the muzzle resulting in a muffled "cough". Suppressors cannot act on a supersonic shock wave continuously generated by a bullet exceeding the 1,087 ft/s (331 m/s) speed of sound at 32 °F (0 °C) ambient cold temperatures, as this shock wave is continuously produced throughout the entire flight path over which the bullet is supersonic, which extends long after it exits the barrel. The downside to the use of .45 ACP in suppressed weapons is that increasing the diameter of the passage through a suppressor decreases the suppressor's efficiency; thus, while .45 ACP is among the most powerful suppressed pistol rounds, it is also one of the loudest. Most .45 suppressors must be fired "wet" (with an ablative medium, usually oil or water) to bring sound levels down to "hearing-safe" (under 140 dB, generally). Rounds are available from 68 grains to 255 grains (4.4 g to 16.5 g) with a common load being the standard military loading of a 230-grain (15 g) FMJ bullet (for comparison, the most common 9mm load is 115 grains (7.5 g), quite literally half the weight). Specialty rounds are available in weights under 100 grains (6.5 g) and over 260 grains (16.8 g); popular rounds among reloaders and target shooters include 185-grain and 230-grain (12 g and 15 g) bullets. Hollow-point rounds intended for maximum effectiveness against live targets are designed to expand upon impact with soft tissue, increasing the size of the permanent cavity left by the bullet as it passes through the target. Tracer ammunition for the .45 ACP was manufactured by Frankford Arsenal and by Remington Arms. This ammunition was available to the United States Border Patrol as early as 1940 and was used through World War II for emergency signalling by downed United States Navy and Marine Corps air crew. Tracer ammunition was identified by painting the bullet tip red. Most ammunition manufacturers also market what are termed "+P" (pronounced "plus P") loadings in pistol ammunition, including the .45 ACP. This means the cartridge is loaded to a higher maximum pressure level than the original SAAMI cartridge standard, generating higher velocity and more muzzle energy. In the case of the .45 ACP, the new standard cartridge pressure is 21,000 psi (140 MPa) and the SAAMI .45 ACP +P standard is 23,000 psi (160 MPa). This is a common practice for updating older cartridges to match the better quality of materials and workmanship in modern firearms. The terminology is generally given as ".45 ACP +P", and sometimes but not always appears on the headstamp. These cartridges have the same external dimensions as the standard-pressure cartridges and will chamber and fire in all firearms designed for the standard-pressure loadings. The inner dimensions of the +P cartridge are different from the standard-pressure cartridge dimensions and thus allows for higher pressures to be safely achieved in the +P cartridge. If +P loadings are used in firearms not specifically designed for them they may cause damage to the weapon and injuries to the operator. Popular derivative versions of the .45 ACP are the .45 Super and .460 Rowland. The Super is dimensionally identical to the .45 ACP; however, the cartridge carries a developer established pressure of 28,500 psi (197 MPa) and requires minor modification of firearms for use. The Rowland operates at a developer established 40,000 psi (280 MPa) SAAMI and may only be used within a select group of firearms significantly modified for this purpose; the Rowland case is 0.057 inches (1.4 mm) longer specifically to prevent it from being chambered in standard .45 ACP firearms. Brass cases for each of these cartridges carry the applicable name within the headstamp. The Super provides approximately 20% greater velocity than the .45 ACP +P; the Rowland approximately 40% greater velocity than the .45 ACP +P. S.A., Pistol, .45-inch Colt Automatic, Ball (1917) was the British designation used for American-manufactured ammunition. The Royal Navy had purchased a shipment of M1911 pistols in 1917 along with enough ammunition for evaluation, training and service purposes. It was never standardized by the Lists of Changes, but was mentioned in the Vocabulary of Priced Stores. It came in 7-round packets and was manufactured by Winchester. S.A., .45-inch, Ball Mk Iz (1940-1945) was the designation used for American-manufactured ammunition and proposed British manufacture of .45 M1911 Ball. Lend-Lease ammunition came in commercial 42-round Winchester or 50-round Western Cartridge Company cartons. US military-issue ammunition came in 20-round cartons, shifting to larger 50-round cartons in early 1942. It was never manufactured in Britain because it was readily available from American forces. S.A., .45-inch, Ball Mk IIz (1943) was a variant proposed for the Royal Navy, but never put into production. S.A., .45" A. C., Ball (1942-1946) was the Canadian designation for their domestically-manufactured ammunition for use in the European theater. It came in a plain 42-round carton that mimicked the capacity and dimensions of the yellow commercial Winchester ammunition cartons sold to Britain through Lend-Lease. S.A., .450-inch, Ball Mk IIz (1943-1956) was used for Australian-manufactured ammunition for use in the Pacific theater. It came in 24-round cartons. ^ JEFFREY., STRICKLAND, PRESIDENT (2014). HANDBOOK OF HANDGUNS. [S.l. ]: LULU COM. p. 151. ISBN 978-1300973294. OCLC 1020871429. ^ a b Barnes, Fred C (2014). Cartridges of the World. Iola, WI, USA: Krause Publications. ISBN 978-1-4402-4265-6. ^ DK (2 October 2006). Weapon: A Visual History of Arms and Armor. DK Publishing. p. 290. ISBN 978-0-7566-4219-8. ^ Green Muse Writers Collective, The (December 2008). Keep Calm Carry on: A Survival Guide. iUniverse. p. 138. ISBN 978-1-4401-0249-3. ^ "Juramentados and the development of the Colt .45 caliber Model 1911 - The Manila Times Online". www.manilatimes.net. 2014-06-29. ^ "ANG "KALIBRE 45" AT ANG PAKIKIBAKA NG MGA MANDIRIGMANG PILIPINO" (PDF). Archived from the original (PDF) on October 9, 2016. Retrieved January 8, 2018. ^ a b "Background Information on the M1911 .45 Caliber Pistol". www.sightm1911.com. ^ JEFFREY., STRICKLAND, PRESIDENT (2014). HANDBOOK OF HANDGUNS. [S.l. ]: LULU COM. p. 153. ISBN 9781300973294. OCLC 1020871429. ^ a b "C.I.P. TDCC sheet .45 Auto" (PDF). ^ "SAAMI Pressures". Archived from the original on October 14, 2007. Retrieved November 29, 2007. ^ McAlpine, Alex. "Pressure to power of combat cartridges". BrainLubeOnline.com. Retrieved November 10, 2013. ^ "Sig Sauer P227 .45 ACP 14RD Extended Magazine". topgunsupply.com. Retrieved 23 February 2017. ^ "Top 5 .45s for Home Defense". gunsamerica.com. 2015-01-13. Retrieved 23 February 2017. ^ Ayoob, Massad. "Choose your ammo ... police style". Backwoods Home Magazine. Archived from the original on February 25, 2007. Retrieved February 21, 2007. ^ Hogg, Ian. Jane's Gun Recognition Guide, 2nd Edition. Harper Collins Publishers. p. 113. ^ Hopkins, Cameron (2000). "Most Wanted". American Handgunner. Publishers Development Corporation. Archived from the original on December 9, 2004. Retrieved February 21, 2007. ^ a b c d e Barnes, Frank C.; Skinner, Stan (2003). Cartridges of the World: 10th Edition, Revised and Expanded. Krause Publications. p. 528. ISBN 978-0-87349-605-6. ^ Wikipedia, Morphinea at English (April 25, 2007). "Kongsberg Colt - Norwegian M1914" – via Wikimedia Commons. ^ MCarranza. "Español: Evolucion de los marcajes de las pistolas sistema Colt del ejercito Argentino" – via Wikimedia Commons. ^ Limited, Bangkok Post Public Company. "Fugitive gunman shoots drug-taking relative". ^ Limited, Bangkok Post Public Company. "Cheap handgun scheme misfires". ^ VCCorp.vn. "Súng ngắn mạ vàng thiết kế riêng cho Tổng thống Mỹ Donald Trump". ^ "Short History of the .451 Detonics Magnum". 2012-08-05. ^ "THE THOMPSON SUB-MACHINE GUN". Archived from the original on August 16, 2000. Retrieved November 11, 2014. ^ "Cartridge Interchangeability". TINCANBANDIT's Gunsmithing. 2014-10-15. Wikimedia Commons has media related to .45 ACP. Ballistics By The Inch .45ACP results.